I am a big fan of Thai food. It could be hands one of my favorite cuisines, and possibly my wife’s as well. I’m always making things such as larb and sticky rice for the kids, things on a stick such as chicken satay, as well as experimenting with things like Thai toast and Thai salsa. You can tell I love the flavors of Thailand, and much Asian food all together. There is something to be said about the amazing combination of sweet, salty, sour, sweet, and bitter when it comes to this style of cuisine. I’ve had my mind on pad thai for some time now, probably because I know that it is one of my wife’s favorite Thai dishes. I wanted to take what I know about pad thai but come up with something different, and something I knew my kids would participate in eating as well. Hence, the pad thai sliders. These sliders are everything you would expect from an awesome pad thai sauce but elevated into a slider. Consider them a perfect few bites for your game day experience, and also an experience into some flavors of Thailand. Let me start by saying that fish sauce has a distinct odor. I only say this because my son had a friend over and as soon as I began making the sauce, the entire house began to stink up, and everyone was pulling that childish gagging sound. I’ll admit, I do not mind the smell because I know that when the sauce is made, well, it is a pretty darn amazing sauce. Start by adding the sauce ingredients to a small sauce pan, bringing it to a simmer, stirring along the way to dissolve the sugar. You want the sauce to reduce by about a quarter or half of the amount for these sliders. Once the sauce has thickened and reduced, set it aside in a small bowl and let cool. Now for the sliders. Add the chicken and pork to a large mixing bowl. Add the salt, pepper, and garlic paste. Now it is time to get dirty. If you have never worked with ground chicken, it is a bit sticky. Using both hands mix the meats, incorporating everything until you have a nice mixture. I like to cover the bowl, and place in the refrigerator for at least an hour to let the flavors come together. Start by making the sliders. Heat a large non stick skillet on medium heat. During this time shape about five of the patties. You want the patty to be shaped like a burger patty, about the size of the slider bun. Wash your hands really well. Add one tablespoon of the oil to the preheated skillet and give that a swirl. Add the pad thai patties to the skillet, bring up the heat to a medium high and let these caramelize for a few minutes. During this time, wash those hands again. After a few minutes, flip the patties and let these cook another few minutes, ensuring that the chicken and pork are cooked through. 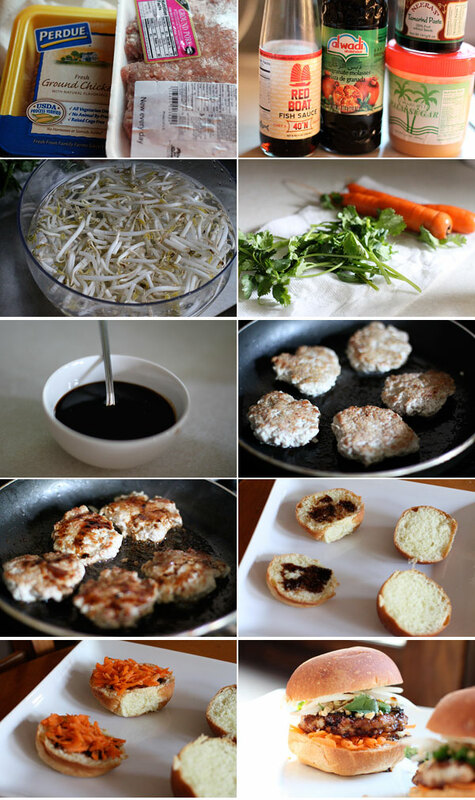 Towards the end of the process, drizzle a bit of the pad thai sauce over each patty, about one tablespoon per patty. The sugars will begin to caramelize as well. They look and smell pretty darn amazing at this point. Remove the patties and place into a small casserole dish, placing in a non-heated oven, just to stay warm. Now let’s make the sliders. Take the bottom of the slider bun and add about a tablespoon of the pad thai sauce to lightly coat. Add some of the shredded carrots, then a pad thai patty, then top with chopped peanuts, bean sprouts, and fresh cilantro. 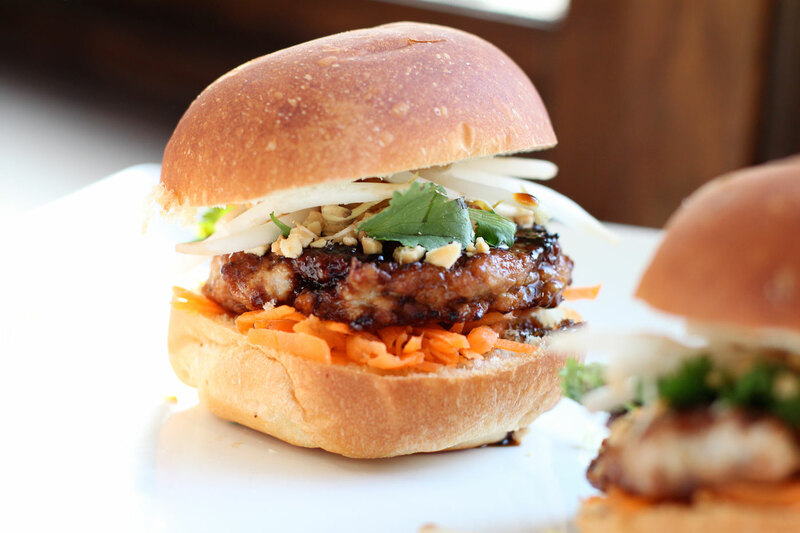 Drizzle with just a bit more pad thai sauce, then top with the top slider bun. Dig in. 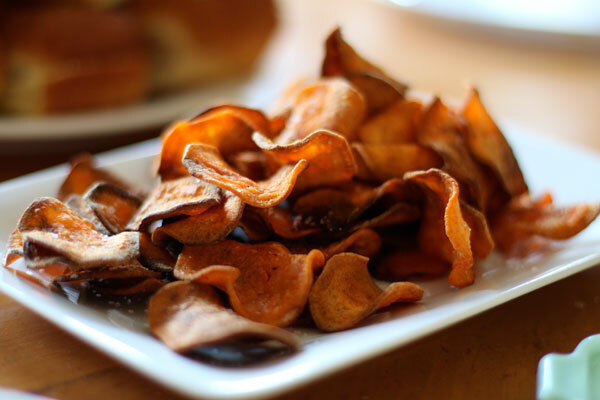 I served mine with homemade sweet potato chips. As my boys were just going for a bun with a pad thai patty, I encourage them to add the veggies. As they were hesitant to do this, and almost resistant, they soon realized that the combinations and textures made this plain old patty something amazing. Did I mention my oldest took down three of them, while the other boy had two? These pad thai sliders are something original and delicious and puts a whole new spin on a pad thai. I hope you enjoy. Let me start by saying that fish sauce has a distinct odor. I only say this because my son had a friend over and as soon as I began making the sauce, the entire house began to stink up, and everyone was pulling that childish gagging sound. I'll admit, I do not mind the smell because I know that when the sauce is made, well, it is a pretty darn amazing sauce. Now let's make the sliders. Hi, I’ve made a few of your recipes and really like them. I was planning on making these sliders this week, but I can’t find pomagranate molasses. What would be a good substitute? Hi Amanda, you might consider trying a bit of molasses with lemon juice, or maybe even molasses with some balsamic vinegar. Think sweet and tart.